StartupCare plans reach about 500 startups in China by mid-2019 and expanding to other key startup cities within the country. Yesterday, Shanghai-based insurtech startup CareVoice (who launched their AI voice-based virtual health assistant for insurers and employers in Greater China in May 2018) announced the official launch of StartupCare, the first health benefit and insurance for startups in China. StartupCare combines a premium medical insurance with fully digitalised health and insurance services. 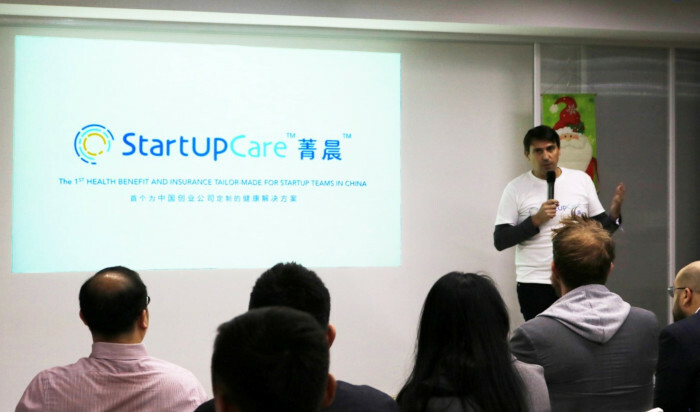 Ahead of the launch, Sebastien Gaudin, co-founder of StartupCare, shared with MobiHealth News on the origins behind StartupCare, the company’s plans for the China market as well as his thoughts on the challenges and opportunities on the growing insurtech sector. According to an article by McKinsey, “insurtechs” are technology-led companies that enter the insurance sector, taking advantage of new technologies to provide coverage to a more digitally savvy customer base. How did the idea to create StartupCare come about? Why do you think the product is unique? CareVoice had a first collaboration with Ping An Health for a specific private medical insurance for kids, and both companies were willing to extend their collaboration and work on an underserved group of customers that could benefit from CareVoice technology platform and data/customer centricity. We did propose several directions and startups were the most attractive, so it was finally retained for the collaboration. The key rationale was startups - once they get their product market fit with revenues take-off and/or significant funding - they need to keep together their core team, hire more staffs to drive/support the growth and share part of revenues/funding with higher salaries / more benefits after years of very limited salaries and no benefits. Health benefits matter because staff members want to have good health status, convenient access to care and financial protection! These three goals are aligned with the interests of startup founders who want to reward their staff while having productive teams. But there was no current solution available: social insurance does not grant access to premium healthcare services while the time-consuming and complicated public healthcare system requires significant out of pocket payments; traditional private medical insurance is highly complicated to understand, its sales channels are not trusted by startups and products very expensive, and there are no digital services while startup teams are tech/mobile savvy. That's how we come up with StartupCare. For Ping An, I believe this is a way to have an effective innovation model by working with a startup to create a new product for underserved "niche" segment requiring technology / digital engagement, new marketing and sales channel with ongoing iterations. The product also has a high potential given that there are 4 million startups in China and the startup staff represents the new generation of workers. What are the plans for StartupCare in China in the short-term and long-term? A couple of months after the soft-launch in Shanghai in May this year, we worked on improving the product / digital experience and figuring out the right customer profile and go-to-market approach. We have nearly 50 local and international startups joining the StartupCare community and established partnerships with multiple co-working/accelerator programs and entrepreneur networks. We aim to scale by reaching 500 startups by mid next year and expanding to other key startup cities in China. We also plan to drive significant education to help founders realise the current limits of how they are supporting their team’s healthcare and the impact on their retention and productivity as we deeply believe health benefits matter and drive performance of startups. In addition, we believe that startups that subscribe to StartupCare provide a good indicator of the ones that have figured out their product / market fit and so the ones that have a great future ahead with the need and willingness to invest in building and growing a great motivated and efficient team! We are going to bring continuous improvement on StartupCare by validating along the way with startup founders, HRs and their teams. For instance, we are now bringing digital enrollment and preparing for the monthly payment system. What is the relationship between StartupCare and CareVoice, which raised its first VC round earlier this year after its pivot into insurtech? The key link between CareVoice and StartupCare is that StartupCare is using CareVoice’s SaaS platform and digital customer experience like any of CareVoice’s current and future insurance companies. It is a bit like SalesForce in the CRM space, do you build your own CRM or subscribe to SalesForce SaaS? More and more insurers realise that they have opportunities to step out from a pure payer role and aim to be true health partners of their members. But they do not have the digital capabilities and customer centricity required for designing such relevant and efficient customer digital experience. More importantly, they cannot keep the pace of tech innovation. That's how CareVoice works together with insurers. In the soft launch period, CareVoice has been handling the marketing and sales activity of StartupCare. Considering we want to avoid any conflict of interest - CareVoice being a SaaS platform working with insurers, and StartupCare a company dedicated to bring insurance and benefits to startups - and we want to maximise both opportunities, our shareholders have endorsed our proposal to spin-off and some of them even subscribed to StartupCare capital increase. StartupCare is thus already backed by CareVoice shareholders including top China-based and International VCs such as Haitao Capital and SOSV as well as local Chinese and Asian healthcare investors. What do you think are the current challenges and opportunities in the insurtech space, both within China and abroad? Insurtech includes a very broad range of service categories that have quite significant specificities by sub- sectors like automotive, travel, life or healthcare. A potentially easier distinction is between full stack digital insurer directly competing with insurers or addressing untapped market segments (like StartupCare), and tech enablers working together with insurers (e.g CareVoice). But in many situation the frontier is blurred... like before our spin-off. One can say if you have a great tech edge why not be an insurer yourself? From my experience, even though big data, machine learning and other techs can accelerate the capability of startups, insurance is an actuarial industry requiring lots of data and experience that can rely on many years of history. Many young full stack digital insurers seem to face challenges to get profitable businesses. That's one of the reasons why we are excited by the StartupCare model that can rely on its insurance partner(s) (e.g. Ping An Health) for co-design and underwriting of insurance plans, and not facing the product claim / loss risk, and so, being able to concentrate on marketing and sales. StartupCare also leverages CareVoice’s SaaS solution and does not have to support large tech investments itself! CareVoice belongs to tech enablers by working with insurers can help them to fix some of their issues and/or improve their efficiencies. We allow insurers to quickly get very valuable customer digital experience and high on-boarding / usage rate for their members. With their members on mobile, then we can support improving their consumption of costly medical services and digitising human-intensive customer service and claims management, and in doing so, drive efficiencies and lower costs! Eventually, we will be able to succeed in both models!